Ancient Egyptian laws were written by the Pharaoh and enforced by him (her) and the officials. Breaking these laws almost never ended well for the criminal, because of the harsh punishments. The decisions to administer these punishments were in the hands of a vizer or an oracle, but the most significant cases were referred to the Pharaoh. 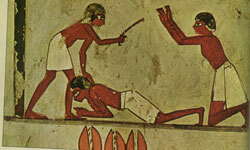 Below you can find a list of the most common fatal and non-fatal punishments of Ancient Egypt. Fatal punishments were rare, but merciless. They were imposed for the worst crimes, such as treason and plotting against the Pharaoh. One of the most notable examples is Ramses III executing a team that plotted against him by impalement – very slow and painful death. Tomb raiding was another crime for which capital punishment was administered. Usually it was decapitation or drowning. These two punishments were also executed in severe cases of corruption – the decision in these cases was Pharaohs. Burning alive was another method used in Ancient Egypt and was administered in cases of vandalism of temples and other places of worship. It wasn’t carried out very frequently because the Egyptians believed that burning alive would rob the deceased of his body and prevent him from achieving eternal life. Perhaps surprisingly, death sentences were rarely administered for murder and manslaughter (no distinction in Ancient Egypt) – well, rarer than in other ancient civilisations. However, there are quite a few known instances of forced suicide in Ancient Egypt, instead of administered death sentence. In those cases, the convicted criminals were also punished posthumously by not being given a proper burial. 100 strokes of a cane, coupled with five bleeding cuts in more severe occasions, were administered for illegal trade and fencing of stolen goods, as well as tax evasion. Sometimes, the cane was coupled with enslavement or exile to Nubia or the Western Oasis. These punishments were mostly inflicted on thieves and often coupled with fines. However, the Egyptians also administered them in order to punish corrupt government officials. Some of them had their noses and ears cut off and were either exiled or enslaved. Torture wasn’t an unusual means of obtaining confessions and details and accomplices of the crime committed. The most common method of torture involved beating a criminal’s foot with a stick (bastinato). Egyptians prisons were deep pits and wells and weren’t used too often. The only known victims of imprisonment are Egyptian debtors and deserters and in those cases, imprisonment was more of a means of preventing escape and forcing them to pay up their debts than actual punishment. Pharaoh Bocchoris has eventually banned punishment of debtors by imprisonment.